An eye-catching addition to your residential or commercial spaces, hardwood flooring gives an instant makeover to every room it graces. If properly pampered, your hardwood flooring can last for multiple generations. Undoubtedly, there’s a lot to love about natural hardwood. Despite its high desirability, hardwood flooring isn’t ideal for every homeowner, or for every space. Hardwood flooring is usually a significant investment. Professional installation is recommended, and certain environments aren’t hospitable to hardwood. It certainly pays to do your just research before committing to these stunning, elegant floors. Today, there are two distinctive hardwood flooring families, with each having some definite advantages. Solid hardwood and engineered hardwood may look and feel identical, but there are some very important differences that play a huge role in your floor’s function. Solid hardwood flooring is the more traditional of the two, since it’s made of solid wood. Solid hardwood is a great choice for those who foresee many décor shifts in their future, since it can be repeatedly refinished. However, this type of flooring can be costly, so you’ll definitely want to make sure your room is compatible. Solid hardwood doesn’t work well rooms that are below grade, such as finished basements. A modern alternative to solid hardwood is engineered hardwood. Engineered hardwood is denser and more forgiving than its solid cousin, and has a water-resisting core. Made using layers of wood instead of one solid plank, engineered hardwood can still be refinished down the road, although not as many times as with solid hardwood. It can be installed below grade, and tends to be more affordable. With many different species of hardwood flooring now available, there is truly something available for all styles and tastes. There are weathered oaks for those who prefer a vintage style, along with sleek mahoganies for those who enjoy contemporary décor – and everything in between. The choice is yours. 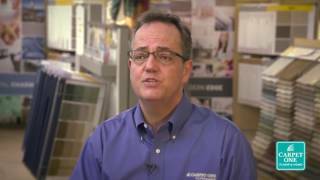 At Buddy’s Flooring Carpet One, we enjoy helping our clients discover flooring that they will feel great about. That’s why we offer up a comprehensive inventory of both engineered and solid hardwood flooring options. We have locations in Corona, Upland, and Ontario. Looking for a little inspiration when choosing your new hardwood floor? Look no further. Visit our Flooring Guide to learn everything there is to know about hardwood flooring.